"Today is an opportunity to make someone love, and understand, music." Mr. Spang received his Master of Music degree from the Eastman School of Music and a Bachelor of Music degree from The Boston Conservatory. He also holds a Masters of Science in Music Education from Western Maryland College. In addition to his duties at Folly Quarter Middle School, Mr. Spang is the tuba player with the Lyric Brass Quintet, and is the Director of Music at Emmanuel United Methodist Church in Laurel, Maryland. He is the former Music Director of The Encore Philharmonic Orchestra, an inter-generational community orchestra based in Carroll County, Maryland. He lives in Westminster, Maryland, with his wife, Laura Baker, son Benjamin, and daughter Sophie. A professional freelance tuba player and brass educator, Mr. Spang had cultivated a studio of over 50 private students ranging in age from eight to seventy-two. Over time, he discovered an ability to communicate with and an affinity to educate middle school musicians. Deciding to teach publicly full-time, he worked towards Maryland Certification through Western Maryland College in Westminster, Maryland, where he was also a member of the faculty. He resigned his post at Western Maryland to become the Director of Bands at Lime Kiln Middle School in Howard County in 1999. He has since been recognized multiple times as a Who's Who Among America's Teachers and a Who's Who in America. 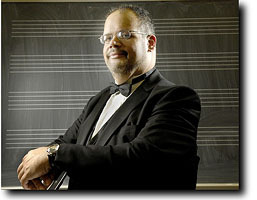 Andrew Spang was selected as the Maryland Music Educators Association's "Outstanding Teacher of the Year" for 2007-2008. A published composer and arranger whose works have been performed in Carnegie Hall and Boston's Symphony Hall, Mr. Spang was pleased to write Lime Kiln Overture, which received its premiere performance on January 10, 2000, by the Lime Kiln Middle School 7th & 8th Grade Band, and Portrait of a King, a work for narrator and band based on the life, writings and speeches of Dr. Martin Luther King, Jr., which was premiered on February 26, 2002. His latest composition is Centennial March, commissioned by the Centennial Lane Elementary School and Director Frank Owens, written in 2008. Mr. Spang has toured and/or recorded with the Lyric Brass Quintet, the Soulful Symphony, Baltimore Symphony Orchestra, American Studio Orchestra, Handel Choir of Baltimore, Eastman Wind Ensemble and the Eastman Trombone Choir. An active recitalist, he has appeared as a soloist in six states and is an Official Stu's Music Shop Clinician and Performing Artist. Photo © André F. Chung, Baltimore Sun.